Always one of the highlights on our Provence Roman Heritage Tour is our visit to the Roman Theatre in Orange. Built in the 1st Century AD, the Orange theatre is one of the best preserved of all the Roman theatres. Playing a major role in the life of the citizens, who spent a large part of their free time there, the theatre was seen by the Roman authorities not only as a means of spreading Roman culture to the colonies, but also as a way of distracting them from all political activities. Mime, pantomime, poetry readings and the "attelana" (a kind of farce rather like the commedia dell'arte) was the dominant form of entertainment, much of which lasted all day. For the common people, who were fond of spectacular effects, magnificent stage sets became very important, as was the use of stage machinery. The entertainment offered was open to all and free of charge. As the Western Roman Empire declined during the 4th century, by which time Christianity had become the official religion, the theatre was closed by official edict in AD 391, since the Church, ever the killjoys, even then, opposed what it regarded as uncivilized spectacles. After that, the theatre was abandoned completely. It was probably pillaged by the Visigoths in 412, and like most Roman buildings was certainly stripped of its better stone over the centuries for reuse. It was used as a defensive post in the Middle Ages. During the 16th-century religious wars, it became a refuge for the townspeople. 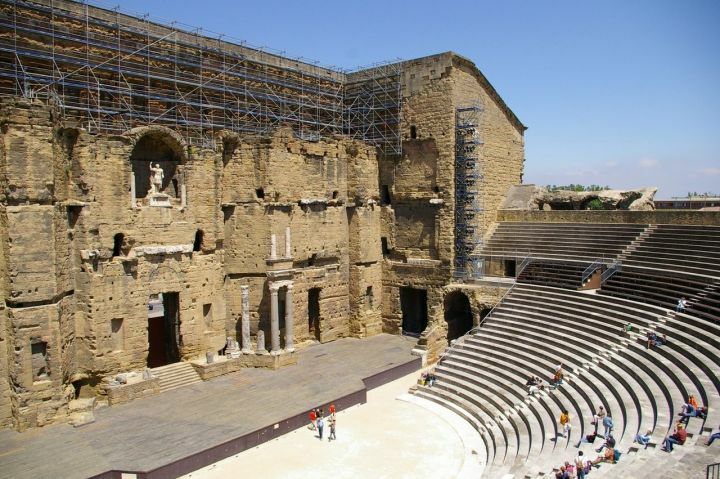 The cultural authorities in France are always very pro-active in enhancing the visitor experience to their sites, and this year the curators of the Theatre have introduce a wonderful new 3D virtual reality tour showing the construction and development of the site by the Romans. A taster can be seen below. The stage, which is 61 meters long and raised about one meter from the ground, is backed by a 37 meter high wall whose height has been preserved completely. This wall is vital to the theatre, as it helped to project sound to the large audience. The wall, also known as the scaenae frons, is the only architecturally decorated surface throughout the entire theatre. It originally was embellished with marble mosaics of many different colours, multiple columns and friezes, and statues placed in niches. The central niche contains a 3.5 meter high statue of the emperor Augustus, although this was most likely a restoration of an original statue of Apollo, the god of music and the arts. The central door, below the niche containing this statue, is called the Royal Door, or valva regia. This door was used only by the most important, principal actors to enter and exit the stage. Above the door was a frieze decorated with centaurs, which is no longer there but is instead on display across the street in the Orange Museum (unfortunately only remains are left). The stage was covered with a modern platform when the theatre began to be used again for operas and other performances.